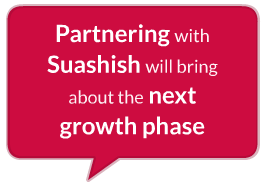 Suashish provides growth capital to established and seasoned business ventures across the spectrum of industries. As long as there is scalability backed by a sound management team leading the way, coupled with a proven record then partnering with Suashish will bring about the next growth phase. The company can either invest through equity, debt or mezzanine financing. Suashish is a long term smart equity investor when it comes to identifying investee companies sitting on the cusp of exponential growth. The company maintains the flexibility to either invest as a majority or a minority partner in the enterprise. Partnering with Suashish also means tapping into the company’s goodwill acquired over decades. Whether to raise further capital, strategic business connect, recruiting senior management, conducting market intelligence programs or even identifying new business opportunities.